Carroll County is a county located in the U.S. state of Arkansas. As of the 2010 census, the population was 27,446. The county has two county seats, Berryville and Eureka Springs. 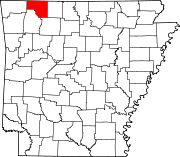 Carroll County is Arkansas's 26th county, formed on November 1, 1833, and named after Charles Carroll of Carrollton, the last surviving signer of the United States Declaration of Independence. According to the U.S. Census Bureau, the county has a total area of 639 square miles (1,660 km2), of which 630 square miles (1,600 km2) is land and 8.7 square miles (23 km2) (1.4%) is water. As of the 2000 census, there were 25,357 people, 10,189 households, and 7,111 families residing in the county. The population density was 40 people per square mile (16/km²). There were 11,828 housing units at an average density of 19 per square mile (7/km²). The racial makeup of the county was 93.63% White, 0.11% Black or African American, 0.88% Native American, 0.41% Asian, 0.08% Pacific Islander, 3.34% from other races, and 1.55% from two or more races. 9.74% of the population were Hispanic or Latino of any race. 10.03% reported speaking Spanish at home . There were 10,189 households out of which 29.20% had children under the age of 18 living with them, 57.10% were married couples living together, 8.60% had a female householder with no husband present, and 30.20% were non-families. 25.20% of all households were made up of individuals and 10.30% had someone living alone who was 65 years of age or older. The average household size was 2.47 and the average family size was 2.93. 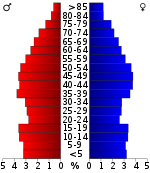 In the county, the population was spread out with 24.00% under the age of 18, 8.10% from 18 to 24, 26.20% from 25 to 44, 26.00% from 45 to 64, and 15.80% who were 65 years of age or older. The median age was 39 years. For every 100 females there were 97.40 males. For every 100 females age 18 and over, there were 95.30 males. The median income for a household in the county was $27,924, and the median income for a family was $33,218. Males had a median income of $21,896 versus $18,159 for females. The per capita income for the county was $16,003. About 11.00% of families and 15.50% of the population were below the poverty line, including 20.70% of those under age 18 and 13.60% of those age 65 or over. Politically, Carroll County is a Republican stronghold in a historically Democratic but now powerfully Republican state. It is included in the Arkansas Third Congressional District, which has had Republican representation since 1967. The Eastern District (Berryville and Green Forest) is heavily Republican. The Western District (Eureka Springs and Beaver) tilts Democratic despite the fact that Holiday Island, a community with a large percentage of relocated snowbirds in the Western District, is overwhelmingly Republican. In presidential elections, Carroll County has voted for the Democratic candidate only twice since 1952. It voted for Jimmy Carter in 1976 and for Bill Clinton in 1992. View from a scenic outlook on US 62 west of Eureka Springs. ^ 2011 Boundary and Annexation Survey (BAS): Carroll County, AR (PDF) (Map). U. S. Census Bureau. Archived from the original (PDF) on 2012-10-19. Retrieved 2011-07-26. Wikimedia Commons has media related to Carroll County, Arkansas. This page was last edited on 14 September 2018, at 01:26 (UTC).